UberCargo and UberRush - The end of local courier companies? Uber, best known for its alternative and industry disruptive taxi service, is now making waves in the road transport industry with its recent expansion into logistical services. It doesn't stop there with an "Uber Everything" project running to explore even more possibilities. UberRush is now operational in New York, Chicago and San Francisco and will be progressively rolled out globally. UberCargo has been launched in Hong Kong which takes their road logistics one step further with an Uber-Van Delivery for quick parcel moves of odd sizes and shapes, at all hours of the day. This expansion of services cleverly utilises Ubers existing technology and crowd sourcing opportunities. These developments are brilliant for SME's as it enables them to leverage cost effective, on demand delivery to distribute their products. Learn more from this YouTube clip. As yet large companies are not really embracing these new Uber services. Their concern is the lack of insurance and guarantees the cargo will arrive safely, or even at all. I am certain these issues can be overcome though. Even Amazon has discussed launching a service similar to UberCargo called “On My Way”, for the last leg of their shipping transport needs. Uber's investors are excited about the potential for growth from this segment on top of current growth of 300% per annum. With revenues now exceeding USD10 billion, the current valuation of the business is approaching USD50 billion. To put Uber's revenue into perspective DHL's revenue last year was EUR14.8 or approximately USD 16.3 billion. City by city Uber will rapidly become one the biggest local, real-time logistics providers in the current market. There’s no doubt Uber will play a fundamental role in the future of local logistics, to what extent though, we are yet to see. One thing for sure though is that local courier transport business will soon come under as much pressure as traditional taxi companies have. In an ever growing and rapidly expanding society, where we have little room to spare in our yards at home or on the port, it seems in more recent times the saying “bigger is better” may no longer ring true. However, whilst bigger may not always be better on shore, out to sea, this saying certainly strikes a very different chord. 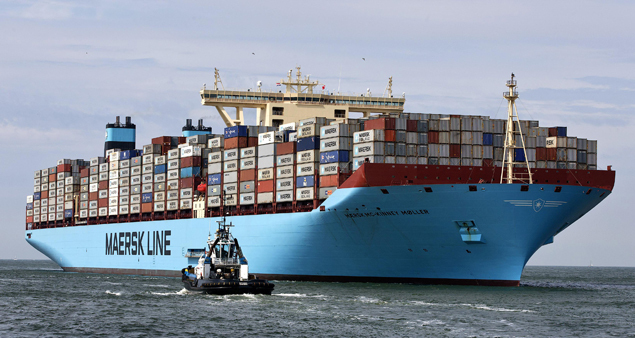 Let me introduce you to Mærsk Mc-Kinney Møller, the world’s largest container ship. Honouring the name of the late Mærsk Mc-Kinney Møller, this feat of danish design is just the first of twenty in the Triple-E Series, proving that bigger really is still better. Affectionately dubbed the blue giant of the sea, this mega vessel stands an impressive 400 metres in length, 73 metres in height and has the capacity to transport 18,000 containers (TEU). That’s no small feat. The secret to its ingenuity however is not in its dimensions, but in its design. Although only four metres longer and three metres wider than its predecessor, the cavity of the Triple-E Series has seen a dramatic expansion. The extra space now accommodates for up to an additional 2,500 containers per haul. Not to be satisfied of just this, the new fleet of giants also emit 50% less CO2 per container moved, effectively halving its carbon footprint. This added environmental benefit is a result of “ the unique hull design, energy-efficient engine and system that uses exhaust gas to produce extra energy to help propel the ship, make the Triple-E unmatched in energy efficiency”. It’s no surprise these giants are creating wakes at sea and in the office. Not only are they more environmentally friendly than their competitors, but they are also unmatched in their efficiency and size. For shippers, you’d expect this would all be good news. Greater capacity ought to equate to lesser costs, right? The answer appears unclear for the present time. As increased capacity drives down rates, shippers are paying less; although potentially not for long, warn Hackett Associates, an international expert and advisory company to the Maritime Industry. They predict that this could be especially true for the US where “some lines have (already) cancelled voyages to counteract the downward trend”. Nonetheless, Hackett Associates report TEU freight in the US to have increased by 4.2 percent from last year, with the first half of 2015 already 6.5% higher than the same period from last year. Therefore despite speculation to the contrary, the global shipping task is on the rise and carriers that lead the way in design and efficiency the future is bright. For sea freight at least, it seems the saying is true; bigger is better. Thanks to +Darcy Cooper for her contribution to this post. Following on from my previous post, if ever I needed more clarity if I was on the right path this accident involving one of my Franna cranes in my own yard was it. Fortunately my crane driver was unhurt apart from a bruised ego. The crane was going to need some urgent expensive repairs though. Coincidentally, or perhaps not, this was the day that I was to announce the plan to my team and sadly make about 75 people redundant Australia wide. I had senior members of my executive team travel to each of my interstate offices with instructions about who we had to let go and how the equipment in all branches outside of Brisbane was to be delivered to our Brisbane yard where it would be prepared for the auction. Letting that many people go at the same time was one of the hardest things I have had to do in business. While, as I predicted, most of the team were into new employment virtually the next day some of them reacted emotionally to the news and didn't want to leave. In Brisbane I had one truck driver who wanted to lash out and fight me and I had the wife of another of my drivers in Sydney call me incessantly for weeks begging me to "give" the Mack Titan prime mover he drove to him. "It is just one truck out of your big fleet and my husband loves that truck!" she begged. News of this decision spread like wildfire throughout the industry and in good trucking and crane company style the rumour mill went into overdrive about my agenda and whether I was forced to do this. There was no hidden agenda at all and I was not financially compelled to take this step. It was a completely calculated and transparent strategy to exit my truck and crane business via auction that would then enable me to potentially reenter the business later if I chose too. Apart from that I wanted to profit from the scarcity I had created in the market and then radically reduce my debt ahead of the then looming GFC. The team that remained with me worked hard with my father to prep all the equipment for auction and move it all into Ritchie Bros afterwards. It was a mammoth task which continued right into the evening on the day before the sale but we got it done. The fleet looked great and was gleaming by sale day. While this was going on RBA's global marketing machine was working well. The local and international interest in the sale was huge as Warwick and I predicted. We thought for sure the cranes would be sold offshore and likely to Dubai where the appetite for cranes at that time was insatiable. I passed this news on to Westpac who were still not convinced about an unreserved auction. They were clearly still very nervous and indeed severely doubted our ability to deliver the required result of a $29m+ overall sale amount. Financiers aside, my personal target was to achieve more than $30m. Day one of the sale rolled around. It was a highly emotional day for me in so many ways. There were so many mixed emotions from straight out fear of wondering if I had done the right thing to excitement at a potentially spectacular outcome. Even though I was confident my strategy would work and I was buoyed by the inquiries RBA had received prior to the sale, the tension and pressure I was feeling was immense. The prime movers were to be sold first at 8am followed by the cranes in the afternoon. "Digger" was the main auctioneer. He was one of RBA's finest and I knew him well from sales in the early days in Subic Bay and of course Hong Kong and Singapore. Westpac turned up in force. They had at least six of their senior guys there with some of them even flying up from Sydney. I reckon they were more nervous than me and I barely wanted to even acknowledge them with the negativity and hell they had put myself and also Warwick through. The crowds the auction pulled were massive both in the yard and online. All of my now former trucking and crane competitors were there. The strategy was perfectly on track. The sale started and as the prices achieved for the prime movers came in mostly at or above what I had forecast with Warwick the tension I felt eased. Most of my fleet was Kenworth and Mack and they all held their value better than the other makes and I was impressed that their dealers were at the sale supporting prices. The real test that day was the cranes though. When Digger kicked it in on them the Manitowoc crawler crane prices went sky high. The bids were pouring in from overseas via the internet and in the yard. What a relief! They achieved far more than new prices and surprisingly all stayed in Australia. The Groves were the same. I could barely keep the smile off my face and my Dad and I were enjoying this now. Now for the Franna's including the one that flipped over. They went through the roof too. My 25T Franna set a world record price of $532k which was more than $100k over the new price. It was spectacular and it was at about that point that the Westpac guys seemed to disappear. At the end of day one I phoned through the total amount achieved to my banking relationship manager as I agreed to do. Despite a good day the negativity persisted. Day two. All the low loaders and ancillary equipment was to be sold today starting with my 16 line platform. Again the bidding was fierce and we were achieving better than new prices particularly on the Drake and Lusty trailers. No sign of Westpac today. By about 2pm Warwick called me on my mobile and asked me to come to his office right away. The sale still had a few hours to run. When I got there he told me to sit down and got me a bottle of water. He was smiling and said "Do you want to call Westpac and tell them to ..... or can I?". "Why? Have we just gone past $30m?" He said "yes". I was ecstatic! We called my relationship manager together who was near emotionless and indifferent about the news. I think he knew I had proved them wrong and that they had destroyed an otherwise good customer relationship with their outrageous fees and antics to get this deal done. The surplus I would now have would barely touch their accounts and my successful freight forwarding business would soon be lost to HSBC. At the close of the sale my fleet achieved a total of $32.5m. It was a fantastic result and Ritchies, my Dad and I were thrilled. One of my crane competitors saw me toward the end of the day and congratulated me. He said that I had made more money selling the fleet than he did operating his own. That would have been true for me too had I kept operating. This auction also set a record for RBA at that time. This was RBA's 50th Anniversary year as a company. Rob Mackay who was a good friend from their Vancouver office saw me at the end of the auction. He told me he, Dave Ritchie and the board considered that I was one of the top 50 people in the 50 year history of their company who had helped the business succeed. I was touched and very proud to be recognised for what I had done as a freight forwarder to them and their customers and also as a buyer and seller over many years. Rob gave me a special 50th Anniversary watch as a memento. All debt associated with the fleet was completely paid out ahead of the GFC and with the surplus I started acquiring other freight forwarding companies and invested in a motorcycle shop in Coffs Harbour. Stories and lessons learned on those deals are to come in the future. When I next saw my Westpac relationship manager he was back in sales mode wanting to keep all of my banking business and offering term deposit deals to me. I told him if they refund the $100k fee and the interest I would stay. He said he would put it to credit. What do you think they said?